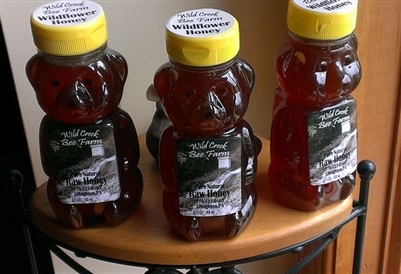 Raw wildflower honey is much more than what you receive from honey squeeze bottles found in the grocery store. Wildflower honey benefits have long been known, but the big corporations would have you believe that processed honey works just as well. The truth of the matter is that processed honey is bad for you while local, raw honey helps with digestion, balances your blood sugar, treats cold symptoms, strengthens your immune system and fights allergic reactions. In addition, nothing will beat the taste of pure wildflower honey. One of the most popular ways to buy honey is in the iconic honey bear bottle, and now, pure honey for sale is also available this way. At Wild Creek Bee Farm in Pennsylvania, we are proud to produce raw honey of the highest quality at prices reasonable for everyone.